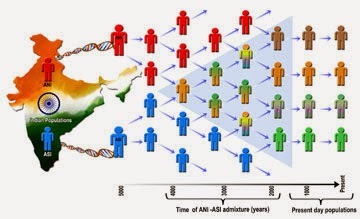 Bloodlines of each and every person in India can be traced back to two genetically divergent populations: Ancestral North Indians (ANI) and Ancestral South Indians (ASI). The genetic mixture between (ANI) and (ASI), started happening around 4200 years ago . From this time till about first century CE or 1900 years ago, ANI-ASI mixtures occurred continuously. Genetic mixing of ANI and ASI stopped suddenly and completely around 1st century CE or around the time when the Manusmriti, which forbade intermarriage between castes, is believed to have been written. When groups in India started following strict endogamous marriages, high incidence of genetic and population-specific diseases that is characteristic of present-day India is likely to have increased. 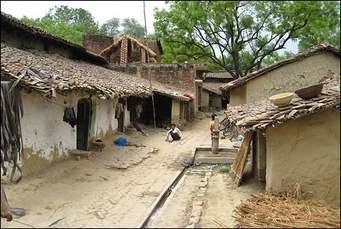 Much has been said about the social impact of India's ancient caste system and how it brought about segregation and isolation of a large section of Indian society known as lower classes. Bringing about injustice and castigations to live a lowly life. This report brings up another evil brought in by this social system as the genetic evidence claims that population-specific diseases of the Indian population increased to high level because of the segregation of the society into a caste system prevalent in India from 1st century CE. Why and how India's caste system originated may never be known. Perhaps ancients had their own reasons to introduce this in the society. Let us not go into that. Question is what is being done now to get rid of this system that has engulfed the Indian society for two millenniums. I have been always at loss, when I find modern day people following tenets that were written thousand or two thousand years ago believing them to be valid even for the modern world. India's caste system can be easily included in this list of tenets. I am therefore feel quite amazed, when I find proponents of such ancient tenets even today, who insist on harping about validity of these ancient tenets and how relevant they are even today. “ Positive aspects of Indian culture are so deep that the merits of ancient systems would be rejuvenated. The (caste) system was working well in ancient times and we do not find any complaint from any quarters against it. It is often misinterpreted as an exploitative social system for retaining economic and social status of certain vested interests of the ruling class." "Misunderstandings of the system may be ascribed to misreading of the texts of Dharmasastras and the impact of the modern 'democratic' and electoral politics. Ancient system of caste organization has been turned into casteism, which negates the very purpose of the system." This one really is a strange argument. We all know that Manusmriti, a book written in 1st century AD expressly forbade intermarriage between castes, Mr Rao comes up and says that these social traditions came up during Muslim rule or in the last millennium. I believe that the least that Indian Council of Historical Research (ICHR) can now do is to say honourable good bye to its chairman, who should be left alone to write his own blogs.